ns and customizes any DC electric motor for higher speed, more torque, or both. 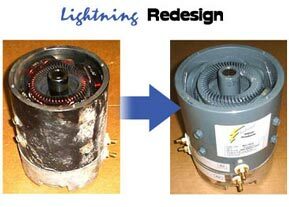 We can apply our Lightning Redesign to any PDS, DCS, regen, series, or standard motor. Modify your stock motor to meet your specific needs. Prices are based on motor model number. Now you can climb hills and go fast with our new Switchable Redesign. Change your stock, series motor into a redesigned Hi-Speed/Lo-Speed motor. Combine it with our redi-made switch kit and switch speeds in motion. Sorry we cannot modify regen, PDS, or DCS type motors with Switchable Redesign. Contact us using our webform or call for more information about Electrical Motor Products’ Lightning Redesign or Switchable Redesign. Electrical Motor Products, INc. stocks a variety of motor cores for redesign and remanufacture. Motors off our shelf include “tin can” reman-stock and modified-stock. Please call or contact us for pricing and more information.